In 1908 there were several new buildings being built in downtown Rock Island: the Safety Building, the London (Quad City Arts) and the Best Building as depicted in the post card above from Greg Binder’s collection. The Best Building, named for owner Louis P. Best of Davenport, replaced an old Italianate building known as the Buford Block. The Best Building was designed by the Davenport architectural firm of Clausen & Clausen to accommodate its first business occupants, Young and McCombs, an early department store. The contractor was Jobst & Sons of Peoria. They would later build the Denkmann Library at Augustana College. The elegant building featured a glass-roofed portico over the main Second Avenue entrance. The portico was supported by chains suspended from the second story. Gentle arches frame the pairs of windows on the uppermost story. And flagpoles lined the roof edge above a copper cornice. To improve natural lighting, courtyards were cut into the side of the building from first floor to the roof top. The building was considered to be fireproof and was equipped with elevators (both passenger and freight), steam heat, and possibly some type of early air conditioning as a 10 ton ice machine was located in the basement. The price for this high quality shopping experience? An early newspaper ad featured linen stationery for 13 cents, 1,500 yards of taffeta and satin ribbon for 25 cents a yard, a 14 quart dish pan for 45 cents, and children’s coats for $3.98. It is not clear how well the Co-operative plan worked. It is clear that Frank C. Young and William S. McCombs were successful businessmen. Mr. Young came to Rock Island with his parents in 1876. He began his working career as a clerk in the Mill Store while at the same time taking a college business course. After running a successful grocery store for eight years, he sold that business and opened a notions store. William McCombs grew up in Iowa, attended business college, and worked for several years in a family dry goods business. He came to Rock Island to manage the dress and silk goods department of McCabe Brothers store, another successful clothier here in town. The Young and McCombs partnership began in 1893, at Young’s store located at 1728 2nd Avenue. It soon moved across the street to a larger building. By 1897, the business expanded further to a “block” of stores at 1723-1727 2nd Avenue known as the Fries Building. This new and modern store was reported to be the first outside Chicago to be equipped with a pneumatic tube system for cash transactions. When a purchase was made, the cash was put in a carrier that traveled thru brass tubes to the business office. In less than a minute the carrier would return thru the tube with the correct change and a receipt. In less than ten years Young and McCombs needed even larger quarters. Quiet negotiations with Mr. Best resulted in the investment of $135,000 in this grand new six story commercial building. Young and McCombs moved their retail business into the lower stories. Offices occupied the upper floors. 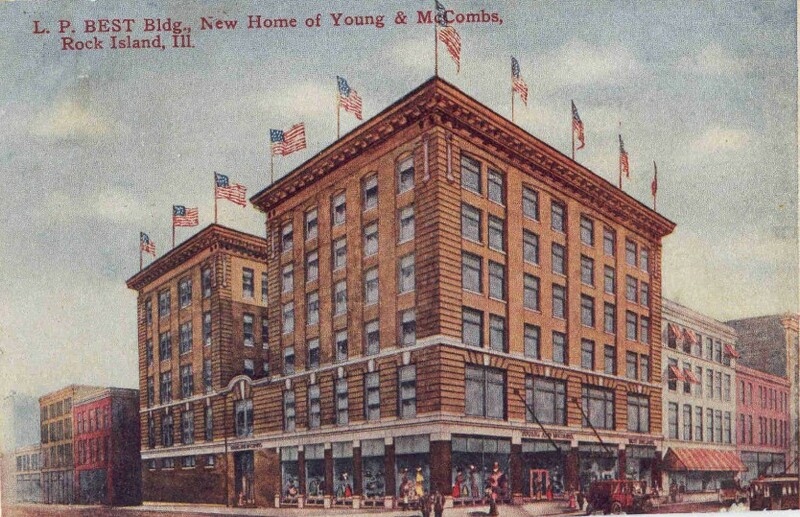 Young and McCombs continued as a department store at this location until the 1920’s. Mr. Best continued his involvement with the company serving as president and treasurer of the store between 1917 and 1920. The last department store to occupy the Best Building was Montgomery Wards, which closed in the mid 1970s. The building was converted to an office complex and was called the Cleaveland Building, later, the Plaza Office Building and more recently the VanDerGinst Building. From its prominent corner of 17th Street and 2nd Avenue, it continues to serve as a strong and beautiful anchor building in our downtown. At the rear of the building, a 1992 mural of Black Hawk by Richard Haas stands guard over the river valley where the Sauk and Fox Indians once lived. This article by Linda Anderson is slightly modified from the original, which appeared in the Rock Island Argus and Moline Dispatch on September 3, 2005.